kalman designs a Kalman filter or Kalman state estimator given a state-space model of the plant and the process and measurement noise covariance data. The Kalman estimator provides the optimal solution to the following continuous or discrete estimation problems. and P solves the corresponding algebraic Riccati equation. Mx updates the prediction x^[n|n−1] using the new measurement y[n]. When H = 0, My=CMx and y[n|n]=Cx[n|n]+Du[n]. [kest,L,P] = kalman(sys,Qn,Rn,Nn) creates a state-space model kest of the Kalman estimator given the plant model sys and the noise covariance data Qn, Rn, Nn (matrices Q, R, N described in Description). sys must be a state-space model with matrices A,[B G],C,[D H]. The resulting estimator kest has inputs [u;y] and outputs [y^;x^] (or their discrete-time counterparts). You can omit the last input argument Nn when N = 0. The function kalman handles both continuous and discrete problems and produces a continuous estimator when sys is continuous and a discrete estimator otherwise. In continuous time, kalman also returns the Kalman gain L and the steady-state error covariance matrix P. P solves the associated Riccati equation. Not all outputs of sys are measured. 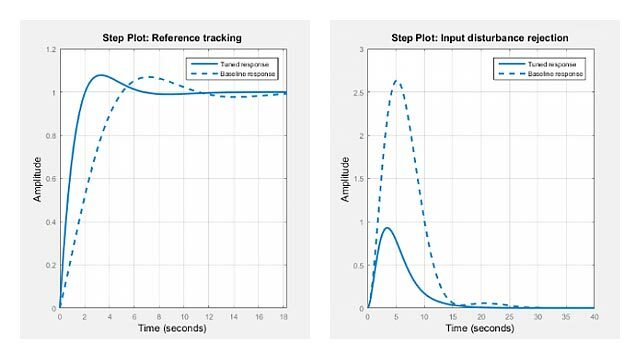 The disturbance inputs w are not the last inputs of sys. The index vectors sensors and known specify which outputs y of sys are measured and which inputs u are known (deterministic). All other inputs of sys are assumed stochastic. See LQG Design for the x-Axis and Kalman Filtering for examples that use the kalman function. Lewis, F., Optimal Estimation, John Wiley & Sons, Inc, 1986. Deshpande, A.S., "Bridging a Gap in Applied Kalman Filtering: Estimating Outputs When Measurements Are Correlated with the Process Noise." IEEE Control Systems Magazine, Vol. 37, Number 3, 2017, pp. 87–93.